425 Beacon is located on the south side of Beacon, between Gloucester and Hereford, with 423 Beacon to the east and 427 Beacon to the west. 425 Beacon was built ca. 1869, one of eight contiguous houses (419-421-423-425-427-429-431-433 Beacon). The houses were designed as four matching symmetrical pairs (419-421 Beacon, 423-425 Beacon, and 427-429 Beacon), and 431-433 Beacon. 433 Beacon was remodeled in about 1897 and the entrance moved to 12 Hereford. Click here for an index to the deeds for 425 Beacon. George Martin Gibson was a builder and contractor, and built the houses at 419-425 Beacon (in the 1869 deed by which he sold 423 Beacon, he refers to it as “the third lot and house from the eastern end of the block now in process of erection by me”). It appears likely that he also built the houses at 427-433 Beacon under contract to the Sawyers and Robert Pratt. 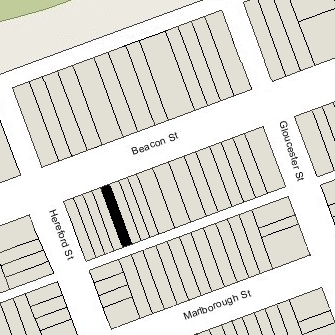 George Gibson and his wife, Frances Rebecca (Esten) Gibson lived at 72 Pinckney and later in Brookline. On June 5, 1869, 425 Beacon was purchased from George Gibson by Helen A. (Barnes) Child, the wife of attorney Linus Mason Child. They previously had lived at 54 West Cedar. Helen Child died in December of 1880. Linus Child continued to live at 425 Beacon in 1888. He moved soon thereafter, and in November of 1889 remarried, to Mrs. Ada (Abbie) W. (Cummings) Wilson, the former wife of George Lindt Wilson. By the 1889-1890 winter season, they were living in an apartment at 259 Beacon. The Child family continued to own 425 Beacon and lease it to others. During the 1887 1888 winter season, 425 Beacon was the home of Mrs. Welthia Loring (Malbon) Bremer, the widow of William Mathias Bremer. They had lived at the Hotel Vendome at the time of his death in February of 1885..
During the 1888-1889 winter season, 425 Beacon was the home of Miss Mary Quincy. By 1890, she had moved to 229 Beacon. During the 1889-1890 winter season, 425 Beacon was the home of Oscar Bishop Stillman and his wife, Mary Anna (Dixon) Stillman. He was a designer, constructor, and operator of sugar refineries, and was superintendent of the Adams Sugar Refinery in Boston. 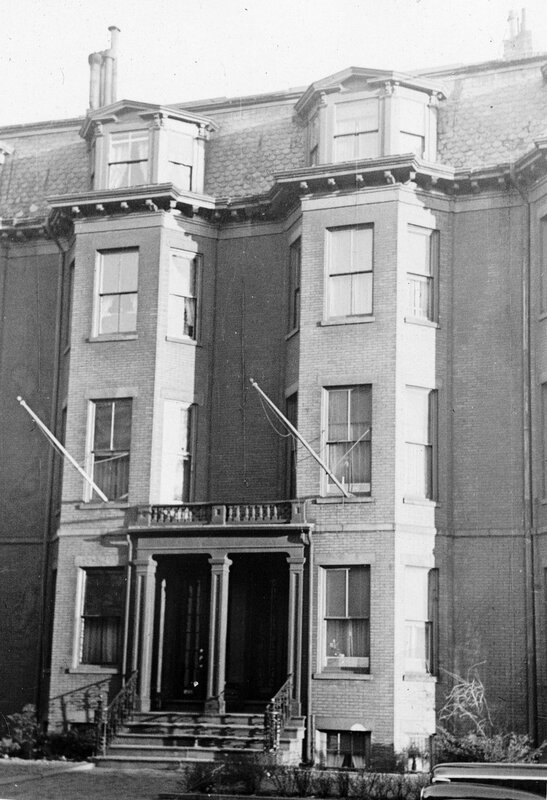 By the 1890-1891 winter season, 425 Beacon was the home of William G. Wheildon, treasurer of the Boston Chair Manufacturing Company, and his wife, Lavinia Frances (Devlin) Wheildon. They previously had lived at 4 Louisburg Square. Their son, William Maxwell Wheildon, a mechanical engineer, lived with them. Linus Child died in January of 1898, and in July of 1899, Lavinia Frances Wheildon purchased 425 Beacon from his three daughters, Helen, Katherine, and Myra Child. The Wheildons continued to live at 425 Beacon during the 1904-1905 winter season. By 1906, William and Lavinia Frances Wheildon were living at 139 Beacon as lodgers; William Maxwell Wheildon moved elsewhere (he married in December of 1907 to Alma Maud Howe and by 1910 they were living in Ashland, Massachusetts). 425 Beacon was not listed in the 1906 Blue Book. On September 17, 1906, 425 Beacon was acquired from Lavinia Frances Wheildon by Dr. Charles Sewall Barrell, a physician. He and his wife, Julia Elizabeth (Folsom) Barrell, made it their home. They had married in February of 1907 and 425 Beacon probably was their first home together. He also maintained his medical office there. They separated in 1916 and Julia Barrell moved to an apartment at 308 Commonwealth. Dr. Barrell continued to live at 425 Beacon until his death in February of 1931. He also maintained a residence in York Harbor, Maine, the title to which had been contested by his wife after their separation. On July 17, 1931, 425 Beacon was acquired from Charles Barrell’s estate by Miss Josephine G. Sullivan. 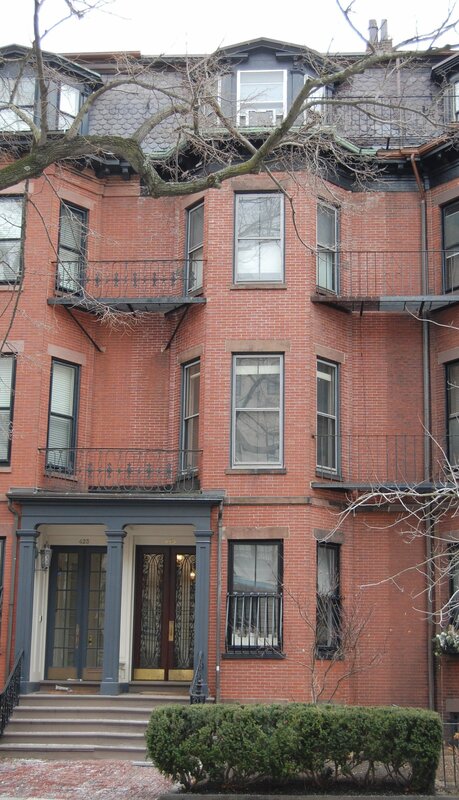 She previously had lived at 520 Boylston. Living with her were Mrs. Mary Ann (Sullivan) Keyes (probably Josephine Sullivan’s cousin), widow of Richard E. Keyes, and their unmarried children: Edwin J. Keyes, a pharmacist, Frances G. Keyes, Louise C. Keyes, and Ruth F. Keyes. The three Keyes sisters all were teachers. They previously had lived at 1916 Beacon. They had moved to 194 Beacon by 1934. By 1934, Josephine Sullivan had married to William George Kuebler, a retired accountant. After their marriage, they lived at 425 Beacon. They were joined by Clarence S. Angell, a retired hardware jobber. and his wife, Ida M. (Curren) Angell, probably lodgers. The Angells previously had lived in an apartment at 89 Marlborough. The Kueblers and the Angells continued to live at 425 Beacon until about 1936. On August 3, 1936, 425 Beacon was acquired from Josephine Kuebler by real estate dealer Henry C. Brookings. In conjunction with the purchase, the property was surveyed and the boundaries slightly adjusted. Originally, the deeds had indicated that it was 17 feet wide both on Beacon and on the alley (the same width as 419-423 Beacon, built at the same time). The new survey established the frontage on Beacon as 16.97 feet and the frontage on the alley as 17.09 feet. In October of 1936, E. Henderson (probably on behalf Henry Brookings) applied for (and subsequently received) permission to convert 425 Beacon from a single-family dwelling into a single-family dwelling and one doctor’s office. On December 22, 1936, 425 Beacon was purchased from Henry Brookings by Dr. Philip Hammond. He and his wife, Edna D. P. (Long) Hammond, made it their home. He was a physician and also maintained his medical office there. They previously had lived in Winchester and he had maintained his office at 483 Beacon. Also living at 425 Beacon were Dr. Hammond’s assistant, Miss Grace M. Cossey, and her mother, Susan (Parker) Cossey, widow of Clarence A. Cossey. They previously had lived at 483 Beacon. Philip Hammond died in February of 1937. By 1939, Dr. Donald H. MacDonald, a physician, maintained his medical office at 425 Beacon. He lived in Newton. He continued to maintain his office at 425 Beacon until about 1941. Grace Cossey continued to live at 425 Beacon, having become assistant registrar of the central directory for nurses. Edna Hammond also continued to live at 425 Beacon until her death in May of 1941. In November of 1942, Grace Cossey, as trustee for the estate of Philip Hammond, filed for (and subsequently received) permission to convert the property from a single-family dwelling and doctor’s office into a lodging house. Grace Cossey and her mother continued to live at 425 Beacon until about 1945, when they moved to 220 Clarendon. On August 29, 1945, 425 Beacon was acquired by Francis Leahy and Frederic D. Sargent. In July of 1946, Frederic Sargent for permission to convert 425 Beacon into a two-family dwelling. He subsequently abandoned the permit and appears to have continued to operate the property as a lodging house. He continued to live there until about 1960. On March 10, 1966, 425 Beacon was acquired by Florence Beth Pockwinse, who operated it as a lodging house. She lived at 31 Brimmer, where she also operated a lodging house. She previously had owned 423 Beacon, which she sold in June of 1964 and then reacquired in January of 1968. At about the time Florence Pockwinse acquired 425 Beacon, it became the home of William M. Triantafilu, who served as manager of the lodging house. He previously had lived at 423 Beacon. He continued to live and operate the lodging house at 425 Beacon until the early 1970s. On December 5, 1972, 425 Beacon was acquired by Robert Collier and his wife, Judith H. Collier. At about the same time, William Triantafilu moved back the 423 Beacon, which he subsequently acquired from Florence Pockwinse in March of 1974. In December of 1972, the Colliers applied for (and subsequently received) permission to convert the property from a lodging house into five apartments. In September of 1980, the Colliers acquired 423 Beacon from William Triantafilu. In January of 1981, they filed for permission to combine 423 and 425 Beacon, converting the combined building into six apartments. They subsequently abandoned the permit. On April 20, 1990, the South Boston Savings Bank foreclosed on its mortgage on 423 Beacon and transferred it to the Guaranty-First Trust Company. On January 22, 1991, the Shawmut Bank foreclosed on its mortgage on 425 Beacon and took possession of the property. On May 21, 1991, Patricia M. Bailey, trustee of the 425 Beacon Street Realty Trust, purchased 425 Beacon from the Shawmut Bank. 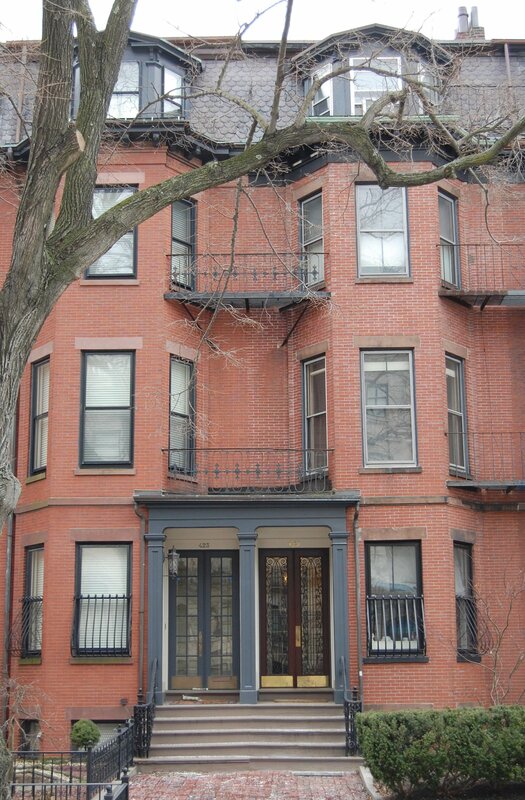 On May 24,1991, she converted the property into five condominium units, the 425 Beacon Street Condominium.